Multiple experimental approaches have been employed to study exocrine pancreatic cancer, including the use of animals as surrogates for the human disease. Animals have the advantage that they can be manipulated to address specific hypotheses regarding mechanisms underlying this disease. Implicit in this opportunity is the necessity to match the question being asked with an appropriate animal model. Several approaches to modeling pancreatic cancer have been established that involve animals. 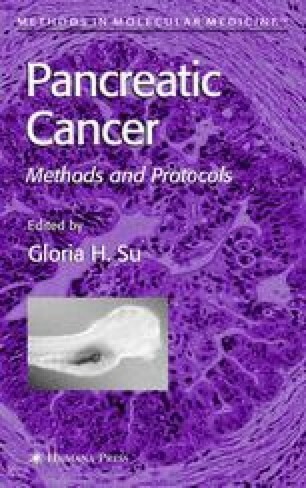 First, xenogeneic cell transplantation, generally into immunocompromised rodent subcutis or pancreas, allows examination of (1) the effect of host environment on human or rodent pancreatic cancer cells, (2) whether specific genetic changes in donor cells correlate with certain cancer cell behaviors, and (3) novel approaches to cancer therapy or imaging of tumor growth. Second, carcinogen administration, typically to hamster or rat, allows examination of whether specific genetic, biochemical, cellular, and tissue phenotypic changes, including progression to neoplasia, accompany exposure to a particular chemical. Third, genetically engineered animals, usually transgenic or gene targeted mice, allow examination of (1) whether genetic changes, including oncogene overexpression/mutation or tumor suppressor gene loss, can increase the risk for neoplastic progression, (2) whether specific genetic changes can cooperate during pancreatic carcinogenesis, and (3) how the genetic signature of a neoplasm correlates with particular biological aspects of tumor initiation and progression. Collectively, these experimental approaches permit detailed exploration of pancreatic cancer genetics and biology in the whole animal context, thereby mimicking the environment in which human disease occurs.